Pre-Civil War Raymond held all the promises of a wonderful new way of life for its citizens. Cotton plantations were located on the outskirts Of town - big new beautiful homes were built - the "Raymond Church" (all denominations meeting together) was organized - hotels were built - and the Raymond Gazette was established in 1844. Raymond was not only popular because it was the new county seat but also because there were two famous health resorts in the area. Cooper's Well, located about four miles from Raymond, was the most famous of the two. 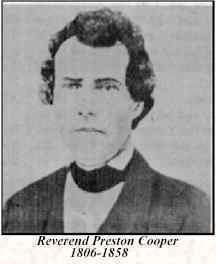 Reverend Preston Cooper, a Methodist minister, bought land near Raymond in 1837 as a romantic location for his home. After building his home on the crest of a hill he was in need of increased water supply so he hired a man to dig a well at the foot of the hill. After going down 30 feet he struck a rock bed and gave up. What Reverend Cooper did not realize at the time was that for the next several years he would be "haunted" by a recurring dream in which an angel would appear and say "Dig, Cooper, Dig". A book called History of Cooper's Well was written in 1851 by a newspaperman and in this book we find an accurate account of Rev. Cooper's experiences set down in his own words: "One night as I lay on my bed wrapped in a peaceful and quiet sleep, induced by a consciousness of being at peace with all men, I dreamed that I saw a figure of a man with a familiar face stand before me, and when I looked the man said: 'Cooper resume the digging of your well; much depends on it; it is all important you should do so, see you do it!' and vanished. So when I awoke I could scarcely persuade myself that it had been a dream." He listened to the dreams which continued for several years and became more determined than ever to dig until he struck water. On Friday 16th, 1841 his dream was realized. After hiring four diggers the well had reached a depth of 100 feet. Neighbors gathered around the well on the final day of digging expecting a disappointment. Reverend Cooper was leaning on the windlass looking down into the well expecting the realization of his dream. Anxiety was at its highest point! A few moments after Cooper looked down the windlass the digger struck his mattock into the crevice of a rock and water appeared. Said Cooper... "It looked to me like a bright coin at the bottom of the well, and in answer to my question, 'what is that,' the digger said, 'it is water but it stinketh mightily, it stinketh so bad you can never use it." On analysis the water proved to be of medicinal help and people came from everywhere to drink of the water. The July, 1899 edition of the Jackson Evening News stated that "the waters had a high reputation in curing dyspepsia and the various intestinal diseases of long standing; in liver complaint, chronic inflammation of the bladder and malaria, in dropsy, and especially in chronic diarrhea." In 1848, ten years before his death, Cooper sold the land to his brother in law who began to make improvements. In less than ten years after the Well's discovery it became a popular resort for the wealthy planters and merchants from Mississippi and neighboring states. A hotel was built on the site as well as a 50-foot observatory where smoke from the steamboats could be seen on the Mississippi and Yazoo River 40 miles away! The hotel became famous for its many attractions - a grand ballroom, a shooting gallery, a billiard hall, afternoon toilettes for women, and mint juleps in the saloon for the men. The largest crowd ever recorded at the Wells was in 1851 when U.S. Senator Foote, then the Union Candidate for Governor in opposition to U.S. Senator Jefferson Davis, addressed possibly 2000 people. The Wells opened for the Season that same day and after the ball that evening over half of the visitors could not be accommodated. Many slept in chairs on the galleries and in the parlor or on the office floor. 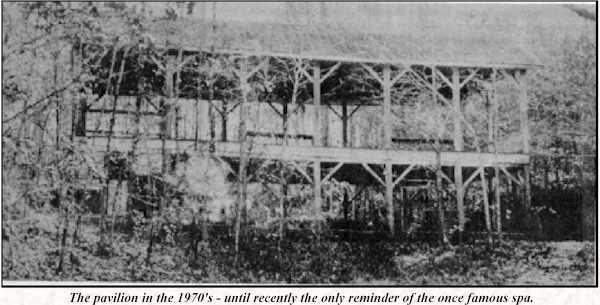 During the Civil War "Cooper's Well Resort" was destroyed by Union troops. After the war the Spengler family from Vicksburg bought the facility and a new hotel was built. The resort then reached its zenith from around 1880 until 1920. Known as the "Saratoga of the South" the hotel could accommodate up to 800 guests. Even today some Raymond citizens can remember Cooper's Well when it was at its height of splendor... "the pavilion for dancing, military parades, the wonderful food that was served, Lake Catherine, a man-made lake covering several acres at the foot of the hills, with all its geese and ducks..."
The other popular health spa before the Civil War was "Mississippi Springs", a settlement even older than Cooper Wells, located off what is now Highway 18, near Raymond. The settlement was famous for having seven springs, each with a different water mineral. "Mississippi Springs" became more or less a camp site where people would go that had faith in the healing qualities of the water. Many of these people would build cottages and stay for long periods of time. Seven Springs Road, a few miles from Raymond now marks the area. Little is known about what happened to Mississippi Springs and why it passed in popularity. Cooper's Well, on the other hand, died a slow death. During the Depression it became an artists colony housing painters and writers working under WPA grants. In 1940 Joe Dehmer of Jackson bought the property but the once famous hotel burned to the ground in the same year. The Pavilion, a two story open structure over the main well - used for dancing - was the last structure remaining on the site. It burned after 1970. The graveled Cooper's Well Road has been replaced by Midway Road as access to State Highway 18. Lake Catherine no longer exists.